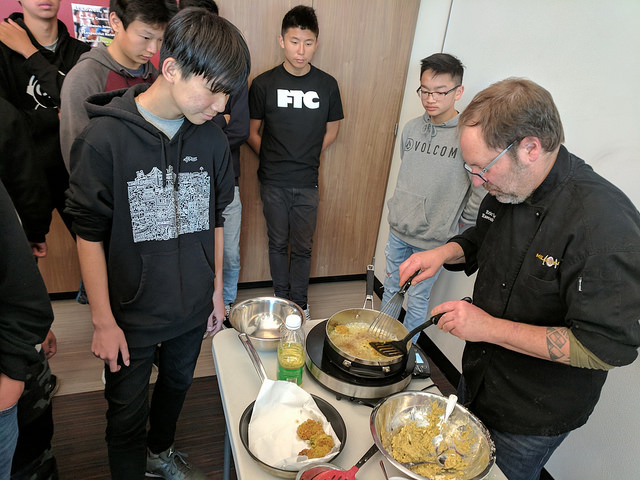 Chef Eric’s culinary passion is to elevate vegetable based cuisine to a whole new level, and he taught our Lowell High School class how to make a turmeric chickpea fritter with ginger-garlic aioli. 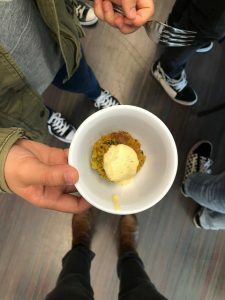 Since the theme for our class that day was Food as Medicine, we focused on how the medicinal properties of ginger, garlic and turmeric are used in their raw form and cooked into dishes to increase the health benefits of those foods. Erick Tucker is the founding and current Chef – co owner of Millennium Restaurant, one of the nation’s premier fine dining vegan restaurants. Eric is the principal author of The Millennium Cook Book and The Artful Vegan, both Ten Speed Press. Eric also helped open Encuentro in Oakland which has one of the very few all vegetarian wine bars. A graduate of The Natural Gourmet Cookery School in NYC, his culinary passion has been to elevate vegetable based cuisine to the sublime! Millennium’s cuisine can be described as a convergence of many ethnic styles with Northern California sensibilities and contemporary presentation. Eric is an avid supporter of the local, sustainable agriculture movement as well as a former instructor and chairing at CHEFS(Conquering Homelessness through Employment in Food Service) in San Francisco. Eric resides in Oakland and is an avid cyclist, musician and mushroom hunter/ forager. 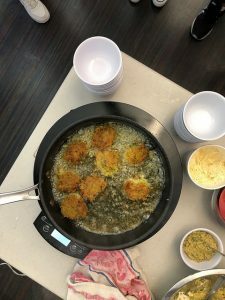 Place all of the ingredients except the oil in a deep sided bowl. In a food processor, place the chickpeas through baking powder, pulse to just break up chickpeas. Add the chickpea flour and pulse. ( If too dry add small amount water). Add the scallion, cilantro, salt and pepper and pulse to just incorporate with out grinding the scallion or cilantro. Form into patties 2-3 inches in diameter, ½ inch thick. Heat a large saute pan over medium high heat. Coat with ¼ inch of oil. Pan sear the fritters about 1 ½ -2 minutes per side, until brown and crispy.